Our weekly lunch time meeting was attended by seven invited guests. After lunch Past District Governor Gordon McGlone gave an informative and interesting presentation explaining the work of Rotary both at home and abroad pointing out the friendships that are made with other Rotarians world wide and the responsibilities and benefits of being a Rotarian. The Talk was well received by all those present. 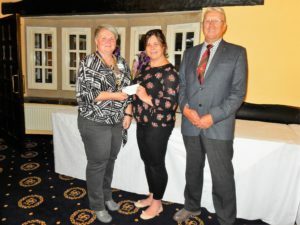 Before Gordons talk President Mandy and Immediate Past President Dennis presented a cheque for £250. to Debbie Moore from Young Carers Derbyshire. Being part of last years Santa collection. We have now donated the full amount collected £2500 to ten local charities.